To raise funds for the 49th and newest club in Rotary District 5040, the largely Filipino Rotary Club of Vancouver Mountainview, for Rotary's global campaign to End Polio Now and for the Rotary Club of Ladner's campaign with other clubs to fund a $45,000 water delivery project over 6.5 kms in the remote village of Ban Xiengdu in Northern Laos, 120 Rotarians, family and friends participated in "A Taste of the Philippines" dinner on October 14, 2017 in Richmond, BC. Guest speakers included (l to r) Philippine Consul General Neil Ferrer, Rotary District 5040 Governor Don Evans, with Deb Sankey, District Polio Plus Chair Brian Finley, Rotary Club of Vancouver Moutainview President Karen Joy Bation and Rotary Club of Ladner President Ulf Ottho. Kevin Evans was MC. 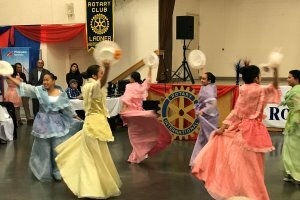 The dinner, at St. Monica Parish Hall in Richmond, was a cultural treat of the Philippines. The taste included Lumpiang Shanghai, Chicken Adobo, Pork Barbeque, Fried Noodles, Veggies in Condensed Milk, Tempura Fish and rice, with Cassava Cake and Leche Flan for dessert. A second treat was the varied performances by the Philippine Cultural Arts Society Dancers and Filipino Canadian Vocal Singers. Emcee Kevin Evans, past president of the Rotary Club of North Vancouver, was an excellent master of ceremonies as always, introducing guest speakers, Philippine Consul General Neil Ferrer, Rotary District 5040 Governor Don Evans (attending with Deb Sankey), District Polio Plus Chair Brian Finley, Rotary Club of Vancouver Moutainview President Karen Joy Bation and Rotary Club of Ladner President Ulf Ottho. Past District Governors attending the event were Leo Nimsick with Diana, Chris Offer, Penny Offer, Sonia Baron, Ken Wilson with Peggy and Lyn Stroshin with Alex. Congratulations to the event organizing team: Chair PDG Sonia Baron, Elena Agala, Beau Brennan, Diana Cabott Nimsick, Kevin Evans, PDG Leo Nimsick, Sandra O'Keeffe, Dawn Rutledge-Brennan, Kathy Storey and Mike Storey.